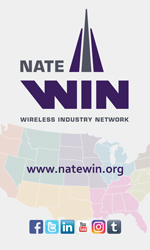 In 1995, Bill demonstrated foresight and leadership in bringing together an initial group of 60 fiercely-independent, competitive tower contractors to establish the National Association of Tower Erectors (NATE), a non-profit association to provide uniform safety standards, education, communications, and serve as a unified voice for the wireless and broadcast infrastructure industries. Today, that organization has grown to 870 member companies consisting of tower construction firms, general contractors, tower owners/vertical realtors, wireless carriers, engineering firms, public safety entities, manufacturers, distributors, technology start-ups and training companies. 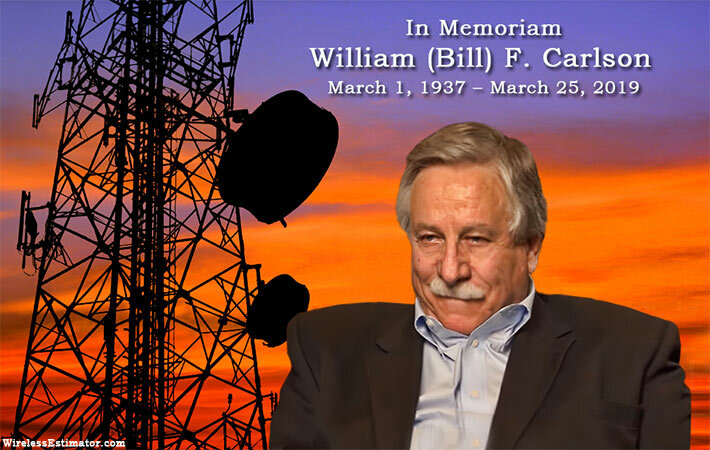 Bill was also recognized on a national scale for his contributions to the wireless industry. In September of 2014, the Wireless History Foundation inducted him into the Wireless Hall of Fame during a ceremony in Las Vegas, Nevada. Bill’s 2014 induction was historic in that he became the first tower contractor ever to be enshrined into the prestigious Wireless Hall of Fame. Bill’s honor also represented a significant milestone for NATE and the prominent role the Association plays in the industry. For those who have never had the privilege of meeting Bill, the below video is a must see to appreciate how he was able to instill pride and integrity in the profession through his calm demeanor and industry insight. “When I first met Bill in Dallas at the formation meeting of NATE, the two things struck me most, were his vibrant personality and his un-abiding passion for fostering professionalism at every level in the tower industry,” said one of the association’s original directors, Ken Meador. “Those formative days and months in the association’s first year were tenuous at best, but Bill was the grease and the glue that kept the fledgling board on track through so many of NATE’s organizational growing pains. I was honored to have the opportunity to work with Bill from day one at NATE, and to have his friendship these past 25 years. Bill’s insights, leadership and comradeship impacted me professionally and personally and I am deeply saddened by his passing,” Meador informed Wireless Estimator. Other founding board members also extolled Bill’s friendship and stewardship. Founding board member and former NATE Chairman Craig Snyder said that Bill was an iconic figure in the tower industry. Founding board member and former Chairman Don Doty agreed that in 1995 the tower construction industry was disjointed and uncoordinated. “Some businesses, like Bill Carlson’s Tower Systems were industry leaders that had to contend with others in the industry that fell short of the necessary knowledge, skill and ability,” said Doty, who explained that Bill spent years coaching the industry to stay focused. “I was a recipient of many phone calls from Bill, that would end with me asking myself, ‘How could I have been so selfish to think a certain way?’. It would take hours or even days for me to ask myself: ‘Hey, how’d he do that?’ ‘How does this help the tower contractor?’, was a frequent question Bill would ask. He taught us a selfless way of looking at our industry. Helping others was always at the forefront,” Doty told Wireless Estimator. Founding board member Craig Lekutis believes that if it wasn’t for Bill, NATE would not have seen it’s continued growth over the years. Bill was unarguably the individual that created the bond with NATE’s leadership and its members’ needs, and Paula Nurnberg, NATE’s Chief Operating Officer, worked side-by-side with him for almost 25 years, gaining a keen insight into Bill’s abilities, drive and successes. “Our association’s founder, Bill Carlson, was a man of the highest integrity. Bill’s quiet strength was well known and respected by all who had the privilege of knowing him. He was a tremendous family man, mentor and friend, who genuinely cared for people. Bill’s story and the admirable and great use of his life spending it for something that will outlast it, is the greatest legacy that he leaves behind and will be remembered,” Nurnberg said. In 2014, Bill was honored as the initial recipient of the NATE Lifetime Service Award during the NATE UNITE Conference in San Diego, California. This prestigious award, which has been named the Bill Carlson Lifetime Service Award in his honor, is awarded annually to an individual who has made a significant and long-term contribution to the success of the NATE mission and has served the Association continually for a minimum of 15 years. Bill is survived by his wife Ruth Lorraine Carlson, daughter Kari Carlson, daughter Kelli Anderson, son-in-law Eric Anderson and granddaughters DeLaney and Avreigh. A Celebration of Life for Bill Carlson of Northwest Angle, Minnesota will be held on Tues. April 2, 2019, at 12:00 PM at Helgeson Funeral Home in Roseau, Minnesota. A visitation will be held one hour prior to the service with military honors by the Roseau Memorial Honor Guard. A lunch and reception will follow at the funeral home with interment at Good Shepherd Cemetery in Angle Inlet. In lieu of flowers, the family’s preference is memorial donations be made in Bill Carlson’s name sent to the 501(c)(3) non-profit Tower Family Foundation. Individuals and industry stakeholders who wish to make a memorial donation in Bill Carlson’s name to the Tower Family Foundation should visit the following website link (http://towerfamilyfoundation.org/get-involved/donate/). Donors paying by credit card should note “Bill Carlson Memorial” in the Company Field of the credit card form. Donors paying by check should note “Bill Carlson Memorial” in the Note Field of the check.